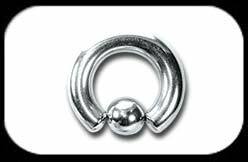 Please note: BCR jewellery in this thickness is particularly difficult to open & to remove & replace the ball. It needs heavy duty ring opening pliers to accomplish this. Please consider this carefully before purchase as we cannot accept returns of unsealed items or items damaged by attempts to open. 8mm steel does not bend easily so please ensure that you have access to suitable extra heavy duty tools before purchasing.